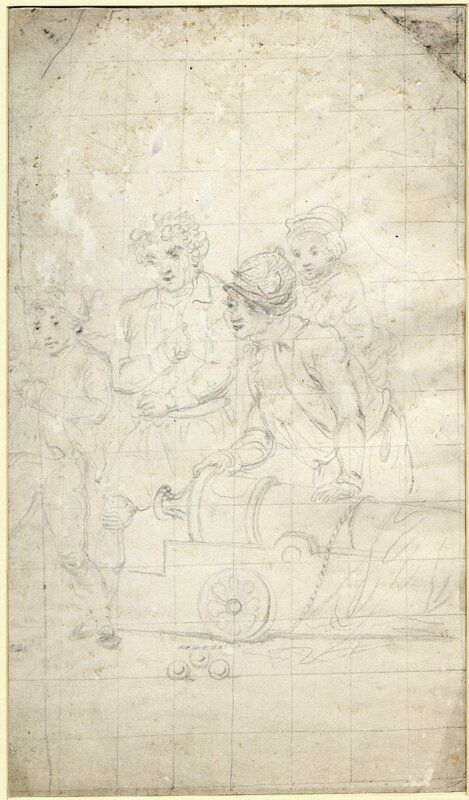 Drawing, Robert Pollard, date unknown, British Museum. The apparent companion piece to yesterday's subject, this Pollard sketch gives us a much better picture of the common sailor. Three tars stand beside a sizable gun, watching their mates pummel each other to the apparent disinterest of the officers in yesterday's sketch. Though difficult to see in the above image, the fellow to the far right is the boxer. Interestingly, he wears a cocked hat with a large cockade on his right! His hair runs into a queue, rather unusual for a sailor. Still, he wears a short jacket and no waistcoat, both of which are more common among tars. Otherwise he wears plain breeches and stockings running to a shoe with a pointed toe. Just to the right is a tall, hatless man with curly hair. He wears a jacket with drop down collar and what appear to be turned back cuffs. Like the others, he wears no waistcoat. 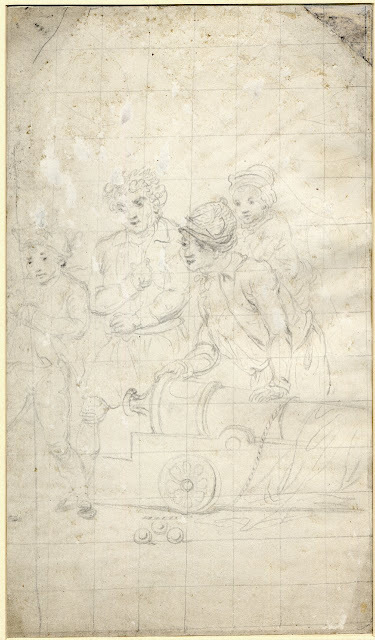 His petticoat trousers are drawn up just a bit so we can see the knee of his breeches before the plain stockings. Leaning over the gun is another of their mates. This one wears a knit Monmouth cap. His jacket is like that of the last fellow, with drop down collar, but no cuffs. Though it is unclear, I think he wears a single breasted waistcoat and cravat. We get a pretty decent view of the pocket to his petticoat trousers. In the background is the last of their mates. Perhaps he wears a round hat with a tall, cylindrical crown, the type more commonly seen after 1780. Alternatively, and given the rough edges of the brim, it could be interpreted as a tall Dutch cap. Unfortunately, there isn't enough detail in the figure to be more exact.